Sir William Wallace, or The Wallace, is one of the most powerful, most evocative, and most well recognised figures from Scottish history. It is a fair bet that today his name is better known worldwide than most if not all of Scotland's monarchs. Yet he was never a king; his notable deeds took place over a very short period of time, part of which he actually spent in France; he fought just two major battles and emerged with a score of won one and lost one; he resigned from his job; and in the end he was betrayed and executed. The wider picture in Scotland at the time is set out in our Historical Timeline. There's a contradiction here. Behind it lies the stunningly good press that William Wallace has received over the centuries. Most notably, the bard Blind Harry wrote an epic 1470 poem, The Acts and Deeds of Sir William Wallace, Knight of Elderslie. This introduced the story of Wallace as the heroic figure we now all know, at times without too much regard for the actual historical facts. When the Victorians got hold of the story the outcome was the construction of the magnificent National Wallace Monument near Stirling. Wallace's reputation in his native Scotland was secure. But it was not Blind Harry who brought Wallace's story to the attention of a worldwide audience, it was Mel Gibson. His 1995 film Braveheart added another layer of artistic license to the one already applied by Blind Harry. The result has been criticised for its lack of historical accuracy. But critics of what is, without doubt, a superbly entertaining and enormously popular film, miss the point. The point is that the historical accuracy of the film doesn't really matter. What matters is the fact that it sparked a resurgence in a sense of Scottish national identity that during much of the 20th Century had appealed to only a minority of Scots. Two years after the film's release, on 1 September 1997 (and on the 700th anniversary of William Wallace & Andrew Murray's victory at the Battle of Stirling Bridge) the UK's new Labour Government held a referendum in which the Scottish people could vote whether to establish a devolved Government for Scotland: what would be the first Scottish Parliament since 1707. We share the believe that the "Yes" vote in that referendum owed a great deal to the effect of Braveheart on our image of ourselves as Scots. So that's the ultimate contradiction in the Wallace story. Wallace's victory at the Battle of Stirling Bridge only kept Edward I and the English at bay for a few months. But exactly 700 years later the myth that had built up around Wallace was powerful enough to persuade Scots to establish their own devolved government. Wallace the myth turned out to have far more historical significance than Wallace the man. But without the man there would have been no myth. William Wallace was born during the 1270s: most say 1272. Arguments continue about his background and his place of birth, with both Elderslie in Renfrewshire and Ellerslie in Ayrshire laying claim to him. 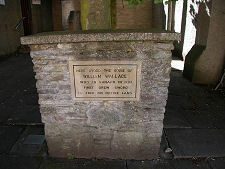 Wallace is said to have started his education with an uncle who was a priest at Dunipace near Stirling. He went on to complete his education at Dundee. At some point fairly early in his life Wallace became an outlaw. This seems to have been for the killing of an Englishman called Selby, son of the English constable of the castle, who insulted him in Dundee. He then killed two English soldiers in Ayrshire who challenged him over his poaching of fish. Wallace's transformation from common outlaw to freedom fighter came in May 1297. According to some sources Wallace had secretly married Marion Braidfoot. He was visiting her and their baby daughter in Lanark when English soldiers became aware of him. He escaped, but the Sheriff of Lanark, Sir William Heselrig, had Marion executed. That same night Wallace and his men entered Lanark Castle, and killed Heselrig and every English soldier present. Scotland at the time was without a king. John Balliol had been forced to abdicate by Edward I of England in 1296 and was being held prisoner in the Tower of London. Scotland was being ruled as a province of England. An "official" revolt of Scottish nobles was under way, but this fizzled out at Irvine on 1 July 1297 without ever coming to a fight, but another revolt against the English was under way in Moray and Easter Ross led by Andrew Murray. Wallace always said that his struggle was on behalf of the deposed King John Balliol, though there was never any indication Balliol supported the rebellion. Wallace became public enemy number one after the massacre at Lanark, and went on to besiege Dundee Castle. Meanwhile Edward I sent a large army north to ensure that the English fortress of Stirling Castle was not captured: and to suppress the rebellion. William Wallace and Andrew Murray met up en route to face the advancing English at Stirling. The Battle of Stirling Bridge on 11 September 1297 took place around the original wooden bridge over the River Forth at Stirling, in the shadow of Stirling Castle. 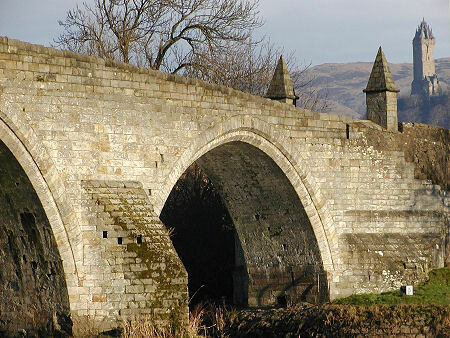 This lay a short distance upstream from the stone bridge known today as Old Stirling Bridge and shown in the header image. The Scots attacked when the English were half deployed across the bridge and won an overwhelming victory. After the battle, Wallace was knighted by an unnamed Earl and became Sir William Wallace "Guardian of the Kingdom of Scotland and leader of its armies." Andrew Murray fared less well, dying some time later from wounds received during the battle. Wallace followed up the victory by leading the Scots into Northumberland and Cumbria, retreating only when the weather became too bad to continue the campaign. The English returned to Scotland in early 1298, trying to draw Wallace into open battle. This eventually happened at the Battle of Falkirk, on 22 July 1298. Wallace placed his faith in massed groups, or schiltrons, of spearmen to repel the English knights. Unfortunately for him the English made much greater use of longbowmen than they had in the past, a weapon against which the Scots had little defence. When the Scottish cavalry abandoned the fight, perhaps through treachery, an English victory was assured. Wallace survived the Battle of Falkirk, but resigned the guardianship of Scotland in September 1298 in favour of Robert the Bruce, Earl of Carrick, and John III Comyn, Lord of Badenoch. It seems that William Wallace then spent some time in France, possibly seeking French support against the English. On 3 August 1305, Wallace, now back in Scotland, was captured by the English in a barn at Robroyston in part of what is now Glasgow. He was betrayed to the English by a man he thought was a friend, Sir John Mentieth, who led him into a trap on the premise they were going to meet Robert the Bruce. Wallace was taken to Dumbarton Castle before being led on a 17 day journey though England in chains. On 23 August 1305, Wallace arrived for his trial in Westminster Hall and charged with range of charges. These included the murder of Sir William Heselrig at Lanark and treason. Wallace was found guilty, stripped, and dragged on a hurdle behind two horses by a roundabout route through London to the gallows at Smithfield. Here he was hanged until almost dead through strangulation; revived; emasculated; then had his intestines and other internal organs "drawn" from his body before being burned. His body was decapitated, then quartered, with the quarters going to be displayed in Newcastle, Berwick, Stirling and Perth. His head was placed on a spike on London Bridge. Wallace is today remembered in many ways, including in the National Wallace Monument near Stirling;	in the William Wallace Statue in the Scottish Borders; in a statue at Edinburgh Castle; and perhaps most famously (though not very accurately) in the film "Braveheart".